Plane carbon footprint: I went a year without flying to fight climate change. I’ve stayed on the ground, to help fight climate change. Here’s what happened. 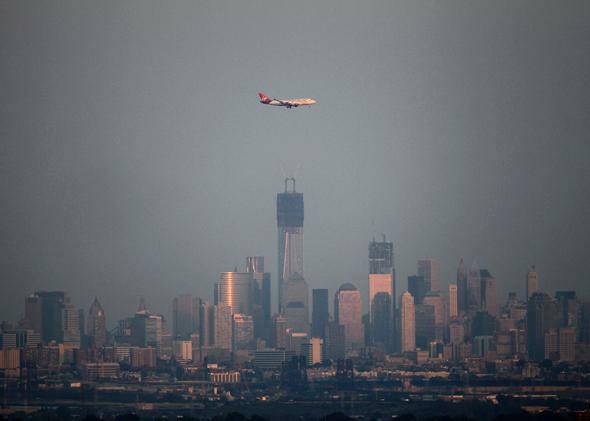 A Virgin Atlantic airplane flies past the haze-covered skyline of Lower Manhattan as seen from the Eagle Rock Reservation in West Orange, New Jersey, on Aug. 31, 2012. On that day, I entered my own version of the Anthropocene and glimpsed a story I think merits far more attention: Climate change isn’t about fancy light bulbs or SUVs or distant glaciers. It’s about people. Real people who just want to live healthy, happy, interesting lives and raise our kids in a world that’s beautiful. I wrote an essay about my decision in Quartz, and much to my surprise, I made international headlines, including the Washington Post, the Daily Mail, the Guardian, Rolling Stone, and more. Clearly my decision touched a nerve. As a scientist and a journalist, society tells me I’m not supposed to have emotions. I’m supposed to report the data and stay objective, tweaking my wording here and there to account for the increasing scientific consensus. But climate change is different. There’s no way you can be on the fence after seeing the data the way I’ve seen it. My wife and I canceled a frequent-flier trip we had planned to Hawaii and instead spent a weekend at the otherworldly ice caves on Lake Superior in northern Wisconsin. I sent our Civic into a 360-degree spin on an ice road to Madeline Island in a moment of pure joy. It was the coldest I had ever been. What initially felt like one of the biggest sacrifices of our decision to stop flying (enjoying the polar vortex instead of Hawaii in February) turned into a moment I’ll never forget. In March, my wife and I embarked on an epic road trip through the drought-stricken West to visit family and friends and report for Slate. That trip changed the way I think about California and opened my eyes to the complexity of water issues rarely seen in front-page coverage of the drought. I also got to introduce my wife to one of my favorite places on the planet: Oregon’s breathtaking Columbia River Gorge, which was shrouded in fog on our early morning transit as we headed home to Wisconsin. There’ve been challenges, too. I work from home, and I first met my editor in person just last month, after nearly a year writing daily at Slate. I’ve also given up work opportunities in Ethiopia and at the United Nations, and speaking engagements on both coasts. Don’t get me wrong, I loved flying. I even, at one time, had a pilot’s license. But there’s something very unnatural about it. It warps your sense of time and place. Jetlag didn’t exist a hundred years ago. I’m not pretending I’m on to something particularly novel here, just that our culture has at times overvalued quick, exotic travel in an era of climate change. It’s gotten to the point that, at least in the United States, train and bus systems prove to be pretty appalling alternatives. (On a recent round-trip Amtrak journey to New York, I was delayed five hours each way because freight trains had the right of way on the route I was taking. All the more reason that bus systems are the future.) At the very least, a carbon tax might help to level the incentives a bit. Before I gave up flying, I’d been trying myself to ignore this dirty secret: For someone so concerned about global warming, each year I was pumping a dozen times the CO2 as the average world citizen into the atmosphere. For all our efforts in recent decades, the U.S. emits almost exactly as much greenhouse gases each year as it did way back in 1990. That’s more carbon per person than almost every other country on Earth. As a country with only 5 percent of the world’s population, our lifestyle has been so outsized for so long that no other nation on Earth is more to blame historically than us. Sure, flying makes up just a few percent of global emissions right now, but it’s rapidly growing. By 2050, aviation could account for about half of total U.S. emissions, simply because nothing invented yet (or even on the horizon) can hurtle metal through the air quite like petroleum. By continuing to take to the skies, we’re locking in the infrastructure and voting for a high carbon future with our dollars. On Monday, I talked to Kevin Anderson, a professor at the University of Manchester’s Tyndall Center who has gone 11 years without flying—though he’s quick to admit that, like me, his emissions are still well above the global average despite being voluntarily grounded. There are technical things that we can do that would avoid us having to make the dramatic radical changes to how we live our lives. The real hard choices are not the shift from fossil fuels to renewables or nuclear or whatever it might be. The real hard choices are the ones that bring about rapid reductions in our carbon emissions. Those are ones that have to do with how we are living our lives today and those are extremely difficult and very few people are prepared to really countenance those. For me, quitting flying is just another choice that brings me closer to living a life that’s in line with what I believe. Our year without flying has inspired me to think about what else I can do during the second year. Maybe we’ll move into a smaller house. Special thanks to my wife, Karen Edquist, for her help with crafting this piece and being a creative and patient travel companion.